Toshiba is currently developing OLED Lighting panels, planning to enter the market in 2015. Toshiba, together with Sony and Hitachi, formed Japan Display in 2011. 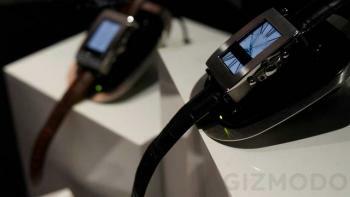 The company also develops flexible OLED panels. Toshiba announced that it will launch its first OLED TV later this year (probably in March). Toshiba will offer 55" and 65" 4K OLEDs in Japan for ¥700,000 (about $6,100) and ¥900,000 (about $7,900) - which is reportedly similar to LG's high-end OLED TVs in Japan. Toshiba will use panels produced by LG Display - which is also supplying OLED TV panels to Japan-based Sony and Panasonic. 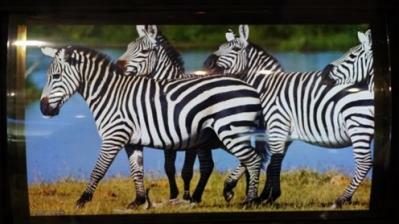 During the FPD International 2013, SEL unveiled a new 13.5" QFHD (3840x1260, 326 PPI) flexible OLED prototype. This is a WRGB panel (white OLEDs with color filters) and it uses a CAAS-OS (C-Axis Aligned Crystalline Oxide Semiconductor) substrate. Toshiba was also showing a flexible panel - a 10.2" WUXGA (1920x1200, 223 PPI) WOLED panel on an IGZO backplane. This seems to be the same panel shown at SID 2013 in May 2013. Finally, Yamaga University's Research Center for Organic Electronics (ROEL) unveiled new flexible OLED technologies, including soluble organic-TFT based panels (on PET). Update: the video has been removed from YouTube... sorry! A couple of months ago Toshiba developed a unique transparent OLED lighting device structure that emits most of the light (over 95%) in only one direction. Now at SID 2013 the company unveiled more information about the new structure, calling these panels "Transmissive Single-sided OLEDs". 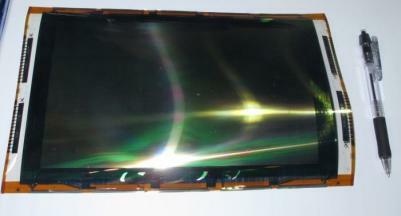 Regular transparent OLEDs use transparent electrodes (usually made from ITO) for both sides of the panel. When the OLED is turned on, it emits light in both directions. Sometimes this poses problems - if you want to embed such panels in windows, for example, you don't want light pollution on the outside which just wastes electricity. In addition, when such OLED panels are turned on they are no longer transparent. The second panels are transparent and Toshiba says that they implemented a unique device structure that emits most of the light (over 95%) in only one direction - which saves light and power in some installations. LG Display's CEO, Han Sang-beom, says that the company is in talks with Japanese TV makers for the supply of OLED TV panels. Han says that the Japanese companies are "very much interested in OLED panels". Last week LG Display finally launched their first OLED TV, the 55" 55EM9700 - which costs around $10,000 in Korea and $12,000 in the US (will start shipping in March). LG capacity is still very low so it seems strange that they will be able to supply other companies besides LGE. 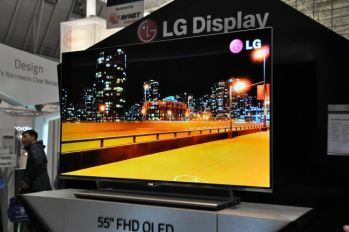 Still it seems that even though LG plans to invest heavily in OLED TV production in 2013, a commitment from another maker for OLED panels will make LGD more confident in its OLED investment. Toshiba held an R&D open house at its Tokyo Headquarters, showing up a few future projects. One of them is OLED lighting. Toshiba unveiled prototype panels that are very efficient at 91 lm/W (@1000 cd/m2). Toshiba hopes to start selling their OLED lighting panels by early 2015. Back in 2010 it was reported that Toshiba (or TMDisplay, really) is scrapping plans for OLED displays, but will continue to do R&D in OLED lighting manufacturing equipment. In May 2011 Toshiba produced 100 OLED based portable lamps and distributed them to quake-hit areas in Japan. Toshiba produced those panels, and Universal Display donated OLED materials and technology for those lamps. It's highly likely that Toshiba is using phosphorescent materials in their new lamp (getting to 91 lm/W with a fluorescent-only design is highly unlikely).